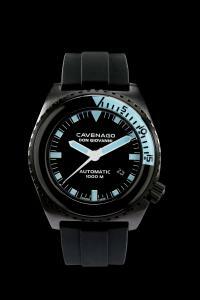 MILAN, MILAN, ITALY, February 12, 2018 /EINPresswire.com/ -- Here's something new from the luxury independent Italian Swiss watchmaker Cavenago – the Don Giovanni which takes its name from the famous opera by Mozart and Italian libretto by Lorenzo Da Ponte. 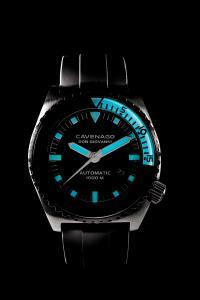 The opera is based on the legend of Don Giovanni – like him the new Cavenago Don Giovanni is independent, bold and never left the people indifferent with its unique bezel configuration and brightly burning blue hands and index. This Swiss-Made ETA 2824-2 automatic watch features a dome sapphire crystal, housed within 46 mm stainless steel brushed black PVD case. 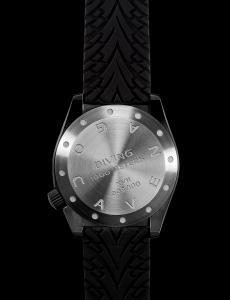 The Don Giovanni is a professional diving watch with 1000 meters waterproof certified; actually the water resistance capacity is tested by making every watch go through a real water test in which the timepiece is submerged and brought to pressure. The screw-down crown, case back and special dome sapphire unidirectional bezel complete the impressive look of this professional diving timepiece. It is hand-assembled in Switzerland and the production is limited to 100 pieces per year.